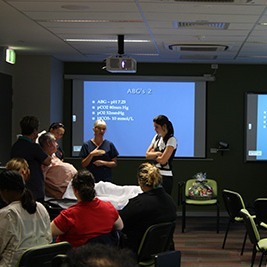 The University of Newcastle Department of Rural Health (UONDRH) provides IPL opportunities for students from a wide range of health professions: medicine, occupational therapy, nutrition and dietetics, medical radiation science, nursing, physiotherapy, pharmacy, social work and speech pathology. 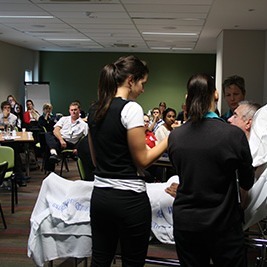 While on placement, students are invited to attend IPL modules, most of which use a scenario to follow a patient through the various stages of diagnosis and treatment, as well as raising the importance of health promotion. 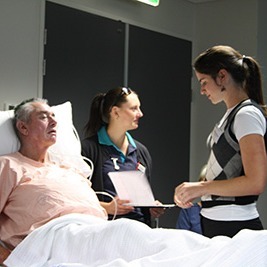 Students are required to interact with each other, with academic staff members, clinicians and, in some cases, with mock patients as they move along the care pathway. It is a great chance to meet students from professions other than your own. Inevitably, because of the rural setting of the UONDRH, the scenarios often relate to how the health care system operates in regional, rural and remote locations. It is generally considered that rural health care is more interprofessional than in large metropolitan centres, so the rural context is relevant to IPL. At the same time, it is important for all health professionals, no matter where they might work, to understand the value of team-based practice in improving patient outcomes and satisfaction with care.